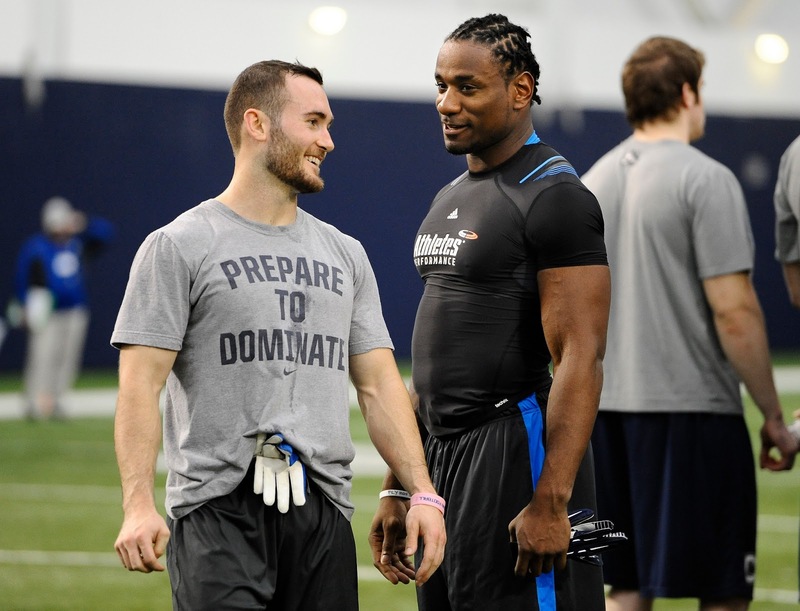 during a break at Wednesday's Pro Day at UConn. There's no question who the headliners are among the current group of former UConn stars taking part in pre-draft preparations. There are some who believe that comeback Blidi Wreh-Wilson may have run his way into first-round consideration after a pair of impressive 40-yard dashes at UConn's Pro Day on Wednesday and linebacker Sio Moore have been soaring up the draft boards with eye-opening efforts in post-season all-star game. I have seen Dwayne Gratz rated higher among corners than Wreh-Wilson and Trevardo Williams certainly has the production as UConn's career sacks leader and dazzled at the NFL combine. Likely the majority of the 29 teams represented at the NFL timing day were lured by the aforementioned quartet who all had scintillating efforts at the NFL combine. However, the Pro Day was a chance for some of the other Huskies to show what they could do. Receivers Nick Williams and Michael Smith, linebacker Jory Johnson, offensive lineman Adam Masters and tight end Ryan Griffin were among the under the radar prospects who should at least be on the radar of the teams who made the trip to Storrs. "I think a lot of these guys have long careers ahead of them and I am really excited for them," Nick Williams said. "I think we will have a few guys drafted and we will have a couple of guys in camps. It just shows that UConn 10 years ago, that wasn’t the case and now you can see that you can make the professional ranks out of UConn and it is all a cycle." While Gratz, Moore, Trevardo Williams and Wreh-Wilson already posted the numbers to catch the attention of all the NFL teams regardless of what happened on Wednesday, that was not the case for their former UConn teammates. "I woke up this morning and said this is really my opportunity to show so I wanted to come out here and have a good day. I think I did pretty well in the weight room and with some other stuff," Johnson said. "Hopefully I did as well as I could, I have been planning for this for a few months. It was great being out there with those guys, they did a great job at the combine and we really showed what kind of players we had. "I've been very busy, it's a lot of hard work. A lot of us were real dedicated, we want this so bad so we put a lot of work into it. You saw it (Wednesday) and you saw it at the combine. "It has been kind of shocking. I heard a lot of scouts were going to be here but then you see all of these guys out here and it is not every day that this many teams come to UConn. It was great. There are a lot of guys out here who didn’t get to go (to the combine or all-star games) so it was good to show. I was real nervous to get out here and I am relieved that it is over, show what I can do and it is kind of out of my hands right now." While the main objective was to dazzle the NFL scouts on hand, Wednesday's event brought out plenty of emotions as it is the last time UConn football's Class of 2012 will share a football field together. "It is fun being back with the guys, just be loose and have fun even though there is some pressure on us, it is fun being back," Griffin said. "It is a good opportunity to show what we’ve got."